I IMAGINE that Monsieur and Madame Garnier are, or were, a calm, well-organised, charm­ing couple who bestowed these attributes on their sons Didier and Eric, two of the most assiduous of restaura­teurs. Eric works at the recently opened Racine in Knightsbridge, Didier at LE COLOMBIER in Chelsea. The conversion of a London pub into Parisian brasserie, in all but opening hours, has been completed by the permanent glazing of the terrace furnished with those chairs made from brightly coloured basketwork plastic strips. We sat “outside” in total com­fort but noted that Sir Harold Pinter and Lady Antonia Fraser and Sir David and Lady Carina Frost, two of the couples diningthat evening, chose to be inside on the ground floor. The menu starts with reason­ably priced oysters, sadly not on display but that is probably against some regulation. L’Assiette d’huitres du Colom­bier is £10.80 for two Fines de Claire, two Rock, two Natives and two Papillon or they can be ordered individually The list is then divided into Les Poissons, Les Viandes, Les Grillades and Les Desserts. When my husband sees snails on a menu he tends to order them (see above). So he started with feuilleté d’escargots à la crème d’ail and I started with a salad of chicory, Roquefort and walnuts which had been chopped into a cohesive whole. Both dishes were fine. Thrilled to see hachis Parmentier (cot­tage pie) on the menu, I ordered that but even a generous appli­cation of Worcestershire sauce, which is brought unasked, couldn’t breathe life into the minced meat and carrots, which had been smothered by too much potato. The relation­ship of protein to starch should be reversed. Turbot sauce Hol­landaise was a thick, generous tranche of fish well poached. It is not so often these days that you see steak tartare on à menu, but it features at Le Colombier, as do such nostalgic desserts as crêpes Suzette, oeufs à la neige and omelette Norvégi­enne (baked Alaska) served for two at £12. We tried crème brûlée, which was comme il faut, and oeufs a la neige, where the clouds of meringue were drizzled with caramel, which provides the essential contrast in textures. There is (deliberately) noth­ing startling about the food at Le Colombier, but if I lived nearby I would use it often. The food is sound and sufficiently varied. The waiting staff are friendly and professional. The mainly French wine list is fairly priced and has a better than usual choice of half-bot­tles and bottles served by the glass. And then there is always the hope of seeing Sir David Frost again. Open daily, noon-3.3opm and 6.30-upm. 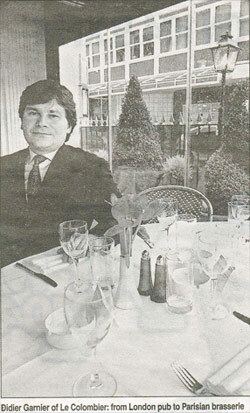 A meal for two with wine, about £84, including 12.5 per cent service.